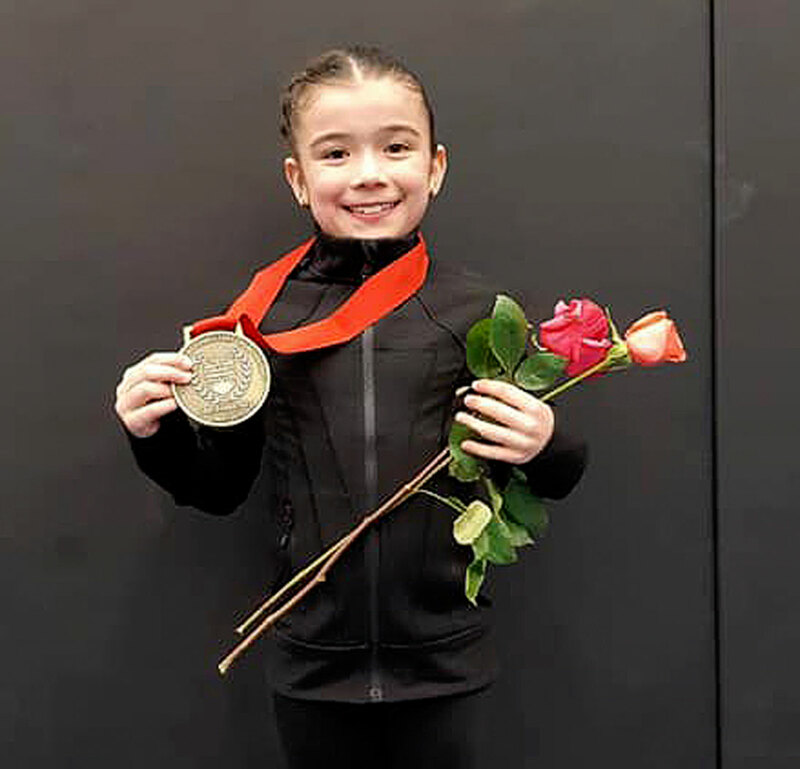 The Polarettes Gymnastics Club was on the move again, this time travelling to Langley B.C, with seven gymnasts to compete in the 2019 B.C. WAG JO Compulsory Championships. The meet was for athletes in the JO (Junior Olympic) 1-5 levels. In the 1-5 JO levels, the routines performed by the gymnasts are compulsory. When an athlete moves into JO 6 they, along with their coaches, will build routines in each event that is unique to the gymnast. Of the seven athletes who travelled, four of them medalled. The other three placed in the top 10. Polarettes coach Naomi Diaz travelled with the team and said it was the first time the compulsory championships were held, as well, it was her first time coaching at an Outside tournament. Cydney Williams, a JO 4 gymnast, won a silver medal on the beam. “The skills that they have to do is cartwheel and handstand,” said Diaz. “Cydney she is so good at her handstand and cartwheels. There is also a split leap and a half turn and the dismount is a handstand quarter half-turn off the beam. All the Polarettes competed in the beam, bars, vault, floor. Diaz said Cydney’s first event was floor and that she was nervous. “I think after she got it done with her nerves calmed down,” said Diaz. Wylloh Dinn, a JO 3, earned bronze medals in the beam and vault events. Due to an injury, Dinn was unsure if she would be able to go to the meet. “Wylloh actually broke her arm in November, December,” said Diaz. “It healed, but she was worried she wasn’t going to do all the testing and be able to go but she pulled through. Dinn said vault is her favourite event. She said when it was announced she was a little shocked when she learned she had won bronze on vault. “I felt happy about it and excited,” said Dinn about how she felt after executing her vault routine. Dinn said she wasn’t as confident with her beam routine but still felt like she put on the best routine she could. Amelie Guilbeault, a JO 4, won a gold medal for her bars routine. Guilbeault did say after her routine was finished she did feel happy with her performance and will now look to move up to JO 5. Layla Hombert, a JO 3 won a gold medal in vault. Diaz said she crushed her routine. “I am at the gym at different times than Layla so I’ve never really seen her vault,” said Diaz. Sabrina Hartland, Sascha Nelson, and Camille Belanger all placed meaning they came within the top 10. Belanger, a JO 5 said she did all right and that floor was her favourite event. Belanger said she thinks she is ready to try JO 6 and she is excited to get back in the gym and working on her floor and beam routines. Diaz is hoping that if the club goes next year they will be able to bring some more gymnasts.